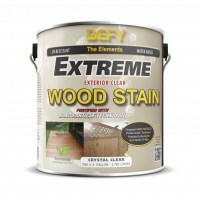 Defy Extreme Clear Stain is Now in Stock! Defy Extreme Wood Stain has been formulated using state of the art Nano-Technology to create a level of durability that has not been available in a clear wood stain in the past. The Nano Particles are similar to Sunscreen. When the Particles are distributed at a rate of over 30 trillion per square inch, they will reflect the sun and provide UV protection that has never been seen in a "Crystal" Clear Wood Finish. A clear finish that protects wood from graying. This is a First in the Industry! Defy Extreme goes on milky white and dries to a clear, flat finish with little to no change to the natural look of your wood. It is sold in 1 and 5 gallon containers and covers 100-150 square feet per gallon depending on wood texture and porosity.